Camara Slate produces the finest roofing slate available. 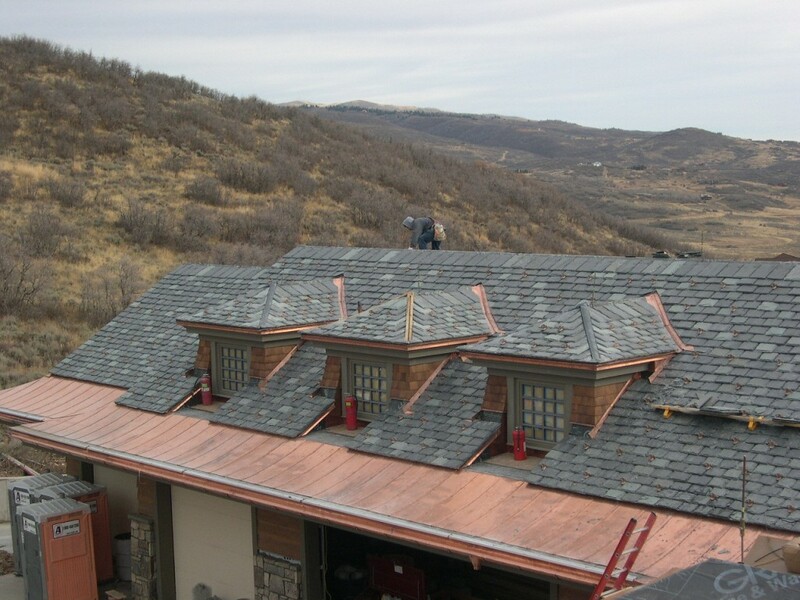 Slate has been used for centuries to create beautiful roofs, renowned for resisting the assaults of rain, wind, and snow. With unique textures, soft colors and unmatched durability, it is the perfect marriage of practicality and beauty, enhancing any environment. Camara Slate quarries and fabricates roofing slate that is ASTM Grade S-1 quality ensuring durability and structural performance for a lifetime. Slate is a natural product and like fingerprints, no two pieces are exactly alike… slight variations will occur in texture, thickness and shading. The combination of excellent appearance and performance has made Camara Slate a national leader for many roofing projects in the US and abroad. The subtle textures and distinctive colors of Camara’s roofing slate will provide the crowning touch to any architectural design. One of the appealing characteristics of slate is the wide variety of natural colors. Roofing slate is classified in three different groups: “unfading”, “semi-weathering” and “weathering” to indicate the degree of color change that can be expected. Unfading means that over time the slate will have essentially no weather tones. The slate might lighten or deepen in color and may have varying tones produced during prolonged exposure to the elements. Semi-weathering slate will change 10% to 25%, whereas weathering slate will change 30% or more. This weathering continues to some degree throughout the life of the slate but does not diminish the longevity of the material. The Camara company offers a full compliment of creative choices that will provide your roof with an enduring beauty that cannot be matched by man-made alternatives. Aesthetically a step above! The durability and minimal maintenance will appeal to any homeowner, contractor or architect. Whether you choose the diminishing course of traditional random slating, or the more regular appearance of sized or patterned slates, Camara slate will enhance any roof with character and visual appeal of a high-quality natural material. Standard texture roofs are composed of slate 3/16″ to 1/4″ thick and are either uniform standard length and width, or one length and random widths laid to line. The texture of the slate is moderately smooth. A rough texture roof utilizes slates which have a varying thickness and whose external surface is rugged in appearance. The graduated roof has the irregular features of the rough texture roof but has even greater variations in thickness and size. The slates are installed so that the thickest and longest are placed at the eaves and then the pieces gradually and proportionately diminish in size until the ridges are reached. Slate from this type can be obtained in any combination of thickness from 1/4″ to 1″. Face dimensions shall not differ more than 1/8″. Slate should be free of knots, knurls, flints and pyrites. Our company takes great pride in its unparalleled service and has the resources to set the standards in the industry. Product availability is the centerpiece of our production team whose focus is to provide the ultimate customer satisfaction. Camara Slate is committed to deliver a standard beyond our competitors abilities, with excellent service and a quality-valued product that is delivered in a timely manner. Printable spec sheet coming soon.